This row quilt was another project from our quilt guild this year. Most of my friends must already be enjoying theirs. 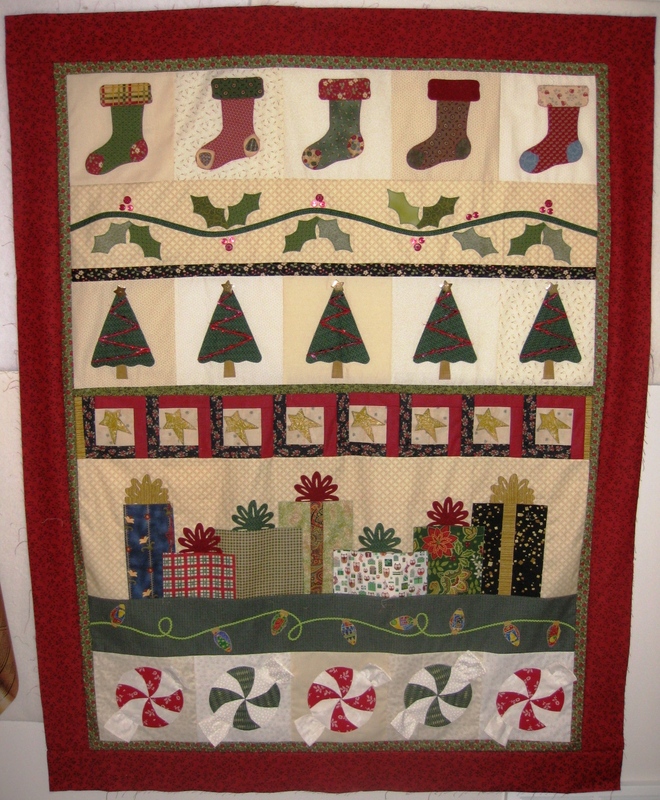 I was hoping to get this quilt quilted before Christmas, but I am not sure I will have time. It turned out super nice, though. 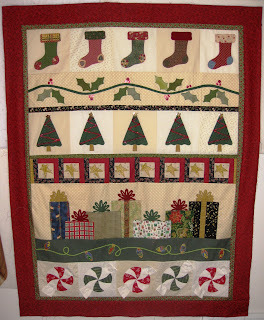 My favorite rows are the stockings and the presents, although the entire quilt has cool features such as buttons on the vine, star buttons as toppers for the Christmas trees, yarn draped over the trees as garlands... One of my friends sewed buttons in the shape of Christmas gifts under some of the trees. I loved it! This quilt is too big for a wall hanging... I may back it with flannel and turn it into a lap quilt, which my boys can then fight over. We were supposed to make it scrappy, which is usually not my forte. However, I managed to include assorted background fabrics, made the stockings very different one from another, and for the gifts I picked fabrics I had not used before. Maybe I am learning! That is truly adorable! I have trouble going "scrappy" also; you did a nice job. I'd love the pattern. Could you tell me who designed it or where I might find the pattern? Thanks! It is a charming quilt. I like the presents and the rows below best but it is very nice. Maybe put it over the back if a chair or couch. I didn't get my Christmas quilt finished. Maybe this next year. You have a very Merry Christmas. I love the peppermint candies! What a cute quilt. It will be fought over I'm sure for many years to come. In my house someone would "call it" so they get it when it's time for the family to divvy things up. Isn't that sweet? Planning for either my retirement to a smaller house or my entry into a better place. Recebi um convite de Tublinha TiaCarminha e vim conhecer seu blog! Big hug and a Merry Christmas! I met your blog through the Tublinha TiaCarminha. It's so pretty! I'd like a pattern for this also!